The chancellor has ruled out a U-turn on axing the 10p tax rate, saying it would be "totally irresponsible" to "unravel...or rewrite" the Budget now. 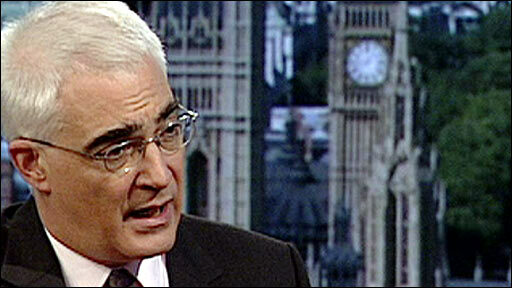 But Alistair Darling told the BBC he "would return" in future Budgets to help those hit by the move. Critics should look at it alongside tax credit and pension changes which had helped the low-paid, he said. But leading Labour rebel Frank Field said promises of "something undefined" in the future did not go far enough. And Conservative leader David Cameron said Mr Darling should "get off his backside" and get into the Treasury to rewrite his Budget. Mr Cameron told BBC Radio 4's The World This Weekend that the Conservatives would be "trying to get the government to stop and think again" on a "pre-meditated tax grab" on 5.3 million people. In his appearance on BBC One's Andrew Marr Show Mr Darling had rejected suggestions the 10p tax rate row was Labour's "poll tax moment" - the policy often blamed for hastening the end to Margaret Thatcher's time as Tory leader and PM. And he said he thought Labour could win the next election "if we can show the determination to win" and show that they understood voters' concerns and show they had the right answers. Mr Darling also confirmed that he would be making a Commons statement on Monday about the Bank of England plan to swap £50bn of government bonds for mortgages. Earlier, Foreign Secretary David Miliband warned in an article for the News of the World that Labour squabbling over the abolition of the 10p income tax rate raised the risk of electoral defeat. He was responding to unhappiness among some Labour MPs - including six ministerial aides - about the fact that people on low incomes without dependent children have been hit by the axing of the 10p starting rate for tax. The tax change, announced when Gordon Brown was chancellor last year but which came into force this month, means people who would have paid income tax at the lowest, introductory 10% rate will now have to pay the 20% rate. It is part of a range of changes which come fully into force in the new tax year. Child benefits, state pensions and tax credits have all gone up. The Commons Treasury committee has said childless single people earning under £18,500 will lose up to £232 a year. On Saturday, Downing Street dismissed calls for a rethink over the abolition of the 10p rate, and denied it would offer concessions to critics. During his Sunday interview Mr Darling said it would be "totally irresponsible" to "unravel or rewrite the Budget. The financial year has already begun". "What I can say though, is that I intend in future Budgets to return to this subject.. this government has a commitment to helping people on low incomes." He said the lowest third of earners had been the biggest gainers from the package of changes and said he had also added another £1bn of help for low-earning people with children in last month's Budget. MPs will get a chance to vote on the 10p tax issue the week after next, when ex-minister Frank Field plans to table an amendment to the Finance Bill calling for compensation for those affected. Mr Field told BBC News 24: "The idea that somehow we'll do something undefined in the future to protect the poorest people in work, just is not on for most Labour backbenchers. "This is a core belief for us and my guess is once we're back tomorrow morning in the Commons the government will get a real feel of just how serious our intent is not to vote against our core belief to protect the poorest." Paul Kenny, general secretary of the GMB union, urged the prime minister to think again. "Any tax regime where the lowest paid pay a higher percentage rate on their earned income than the super-rich elite do on their unearned income and profits, is fundamentally wrong and unfair," Mr Kenny said. Shadow chancellor George Osborne told The Andrew Marr Show: "We know, thanks to the pressure we exerted earlier this year on issues like capital gains tax, that if you push this chancellor enough, he gives way." "I think it is manageable to come up with a tax package that protects those on low incomes... they shouldn't be the people who are paying the price for the government's economic incompetence." Liberal Democrat treasury spokesman Vince Cable said: "The doubling of the 10p rate of tax is a £7bn tax grab from some of the poorest in society. "The belated conversion of Labour backbenchers to oppose this tax rise is welcome, but it does raise questions of where were they on this issue last year."